Inbound marketing is a web of platforms and places where you meet your target audience. Fix and solve their problems, and convert them into customers. If you get this right you will be the dominant authority in your niche. When you put in the work of strategic inbound marketing methods, over time, you will reap long term benefits for your business and your life. In this post are the keys to expediting this process for you. The answers and how-to’s to save you the years of time, thousands of dollars in courses, to eliminate almost any external failure you could encounter. The work that my wife and I have done over the past years, and are still doing today, has reached a point that it is yielding us more visits and paying customers each month than we gain through large amounts of paid advertising. You will have the same results. You will have a living, breathing organism that is on autopilot, working for you even when you take a month off, OR MORE, to travel, be with your family, and do whatever you want to do. All the while your organic marketing machine (with zero paid ads), your digital assets you have invested time and energy into creating, are reaching new audiences and converting them into fans and customers. By implementing this strategy, putting in the “right” work, you will have location freedom, time freedom, and financial freedom. Here’s what you are building and how to benefit from a successful inbound marketing strategy. Your web of platforms and places that you build are all touch points. They are places in your funnel, that you get to meet and connect with new and existing customers, clients, and fans, in your niche. We are continually publishing new content to answer more questions, serve more solutions, challenge, and encourage more often and BETTER than any other company, site, or brand in our niche. This is a process though. It is not easy, it is real work. But it is a predictable formula that if you stick to, you will win from. My wife is doing it everywhere her niche is and has been growing and working her inbound marketing for over 8 years. My business is newer and started a little over a year ago. By moving through this process, wherever in it you are. You will establish touch points, where you grow a fan club and become one of the most impactful organizations, or people in your fan clubs lives. You will attract, convert, close and delight within these touch points. Here are the nuts and bolts of how and where you grow these online touch points. (Disclaimer - this is after years and years of figuring it out, thousands and thousands of hours learning and optimizing our inbound marketing. My goal here is to not make you feel bad that you are not doing all of this. The point I want you to pick up on is that you have to start from where you are. First and foremost you have to be active and always moving forward. Grow and nurture your garden of online assets, in as many directions as you can. At the exact same time and on any given day. We're publishing to Pinterest, YouTube, our blog on WordPress, to Facebook, to Twitter, and Instagram. Everywhere we possibly can. 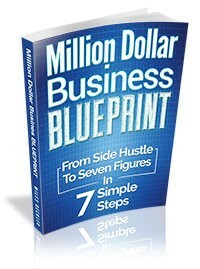 Anywhere that your target market currently is and will be in the future. You’re there and you’re putting out goodwill content. We're putting out content that makes them feel good on Facebook. It makes them click the “Like” button on Instagram. It makes them click the “Save” button and pin it to their boards on Pinterest. And we do it on every platform that our target audience is on. If you're successfully using an inbound digital marketing stratagy, everything that happens is on autopilot. You're making connections and touch points with your audience everywhere they are, even while you sleep! You're introducing your philosophies, your ideas, your point of view, and showing how you in your niche works. This does not mean that you post the same thing on each platform. Each platform is different, right? You have to learn and understand each different platform that you are posting content to. 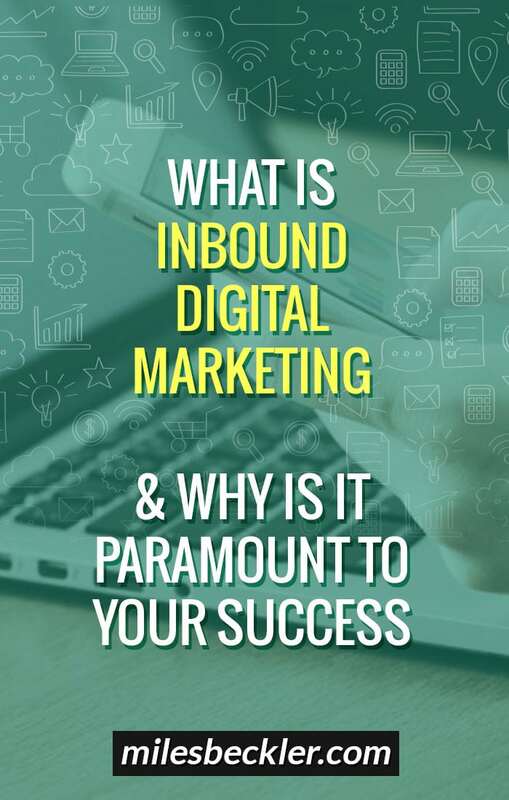 If you get this wrong you will not leverage the full power of inbound digital marketing. It's not about creating one piece of content and syndicating it out to all the different platforms. This is something many get wrong. If you get this interacting with each platform in the correct way, you will be set apart from most if not all in your niche. This posting and interacting with each platform differently is what actually makes the power of inbound marketing really come into play. To use the most basic kind of example let’s talk about an image. An image on Instagram is designed to be a perfect square. So we want to make sure when we're publishing to Instagram we're using perfect square based images that match Instagram’s platform design. On Pinterest we have a very tall and slender image. It's not very wide and it's really tall because that's how Pinterest is designed. That's how Pinterest user interface works. Facebook is kind of wide and short, kind of like a widescreen television. So we would then create another version of our image for our Facebook account that fits in with the Facebook interface perfectly. With this image, we might have the same background. We might have the same text, but we're actually going to create a separate image for each platform we are posting to. This is the big picture. The big idea around inbound marketing content. You have to cater the content to the platform that it is going on. Let's say we complete a really great blog post on a specific topic. All of the images that were made for the blog post, get recreated for the other platforms we are going to post to. We create multiple Pinterest sized images, multiple Instagram sized images, multiple Facebook images. Then we go out to each of the platforms, post the made for that platform image, that links back to to drive traffic to our blog post. For video we create a separate unique video. One for YouTube, one for facebook, etc. This blog post that you are reading started out as a video on my YouTube channel. But you'll notice it is not just a transcript. I'm not having a tool transcribe the video to text and pasting it into a blog post. I am working with a writer and an editor to make sure that that content is very readable. I could try to take the shortcut and just post the transcription, but when you read transcriptions they’re kind of funny. Which would be shooting myself in the foot. You need to understand the shelf life of the platforms that you are publishing to. You’ll notice on my YouTube channel I talk a lot about SEO, YouTube SEO and Google SEO. The reason I bring it up over and over again is because knowing and understanding shelf life will help you work smarter. When you go publish something on Facebook it has a very short shelf life. When you post a tweet it is off the map in less than 30 minutes. Instagram’s shelf life, is less than 2 days. However, if you spend your time putting out a really detailed, super-powerful, beneficial blog post; then that blog post can gain traffic from Google for years and years and years. You want to harvest more than the effort used to create it. Your blog is going to live on it’s platform, working for you for a long time. In the same way, when you put out a spectacular video that really helps people, that video can get tens of thousands, hundreds of thousands, even millions of views over the course of it’s lifetime. And the work that you invested, creating and editing one video, can generate you traffic for years to come. Remember this has been years and years of learning the system, of developing the rhythms, developing the process of systems, to post this content to each of the platforms that we are utilizing. When we started we were pretty much only pushing our content. The term inbound digital marketing was not even in our vocabulary. We were putting content on our blog and we were pushing it out through Twitter. Then we started adding a few YouTube videos here and there. When Facebook gained traction and the fan pages came out, we started a Facebook page to put more content out on there. You don't necessarily have to go out to every single platform and excel on every single platform. And sometimes it doesn’t make sense to be on every platform in every market. Find the ones that match your personality type, the style that is in your DNA. Let’s look at using a blog post as a piece of our inbound marketing strategy. The most powerful thing you are building with a blog post, is you are leveraging organic SEO. Most people trust that Google will provide them the results that they are searching for. They go there to type in their problems. Or they type in the solution they're looking for in the Google search bar. That user trusts Google will give them a relevant result. You benefit from that Google-trust-relationship when they click on that link google populated for them. They endow you with that trust. Inbound digital marketing just started. They just connected with your first touch point. You may have heard of the old sales analogy, or concept, that it takes seven touches to make a sale. It’s an old inbound or inside/outside sales technique. You need to stay in touch with people. The “fortune is in the follow-up” is what people used to say, and they were right! You need to make five, six, even seven touch points with these individuals. And you can actually automate this process through inbound marketing. So they might go to Google to start. They might search in a search phrase that actually leads them to one of your blog posts. Touch point number one: They might read your blog posts. In your blog there is one of your videos. They click this video then it loads onto YouTube. Touch point number three: Then they watch another one of your videos. Touch point number four: At the end of that video they look to see what kind of social media links you have for different social media profiles down below. They click over to Facebook. Then they look at you Facebook page. Touch point number five: Next they are looking at your Facebook page like “wow, I really like this.” They click the “Like” button, they click follow. Touch point number six: Now they’re taking a step towards connecting with you in the big picture. They see a link on Facebook you just posted, for another great article, and it’s relevant. Now they are back on your website by this point. And in the process of five to fifteen minutes you've been able to touch them. Right? You've had five, six, seven different touch points on multiple different platforms that all work together. They are platforms this user trusts. They trust you too. They trust Google. They trust their Facebook account. They are comfortable on these platforms and they've just encountered you and your content in all those places. This leaves them with a feeling of “Wow. This person really knows what they're talking about. Something happens at this point. They dig deeper and deeper into your content. I call it going down the rabbit hole. They consume more and more of your content and they effectively build a relationship with you. You can have the same inbound marketing benefit from your YouTube channel. Every search phrase or suggested video you populate for becomes your first touchpoint. After that first video view they watch another. Over the course of an hour, or two hours, or three hours of watching these videos they develop a feeling. Find what platforms you enjoy most and get really good at those. For me it's been YouTube. I'm been really focusing in on youtube for a little over a year now. I don't have a fan page yet. I don't really care. I'm barely on Pinterest. For me it's YouTube and my wordpress blog. That's my one-two punch combo. You need to find the place or two that make the most sense for you. To make sure you're starting, planning, and executing on your content marketing goals. If you are a quarter of the way doing 6 different platforms. Stop! Crush one and do 60% as good on a second one first. When you have that going consistently integrate a third. But it's not what I’m good at. I'm not great in that ecosystem… yet. Where are you going to get touch points with your customer? What platforms are your target market on and using every day? Which one or two of those platforms fit in with who your are? Start there, and then what’s the next one for you to add on? This is how you define, develop, and grow your inbound marketing strategy. Whether you choose YouTube, a blog, or a social social media platform. Like I said in the beginning this has been really powerful for my wife and I and it will be for you too. If you've ever looked at my YouTube channel or blog saying “Miles you're talking about video marketing, social media, an email list, SEO, and Facebook ads. Are you doing everything?” Yes. I am doing everything. I do all of it because it is how you benefit from a holistic inbound marketing strategy. Your audience will stumble upon you because you are where they are. They will be engaging with your content. Absorbing your theories, your philosophies, and growing trust in you. We go down the path of having these different touch points, so that when you do ask for the sale, or you ask for the opt in, your fans will want to respond because you have imparted so much value to them. You will receive emails asking you for your affiliate links, you will receive book orders when you offer a book, you will receive course sales when you offer a course, you will sell physical products when you offer them your products. It is a predictable formula that if you stick to, you will win from. Leave me a comment below, I’d love to know what your first one-two punch combo is going to be?